Supreme Court Justice Antonin Scalia’s death has led to an unprecedented political crisis, as Senate Republicans have said they won’t consider ANY nominee President Obama puts forward to fill the vacancy. 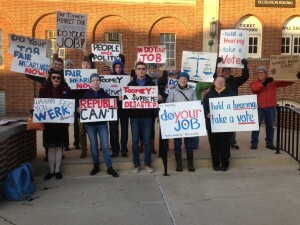 On Monday, March 21, Republican senators headed home for a congressional recess, so the Why Courts Matter PA coalition held rally events throughout the state, each targeting Senator Toomey’s district offices for his obstruction of Supreme Court nominee Merrick Garland. Right as the last rally in Pittsburgh ended, Senator Toomey announced he will hold a meeting with Judge Garland. Press outlets such as Politico also acknowledged this was a direct result of the grassroots actions of the Why Courts Matter PA leaders. President Obama has nominated Judge Merrick Garland to fill the vacancy on the Supreme Court. Judge Garland is highly qualified and his qualifications to serve on the Supreme Court are above reproach. But Republican leadership, and Republican Senators across the board have said they will not consider his nomination. Many have gone so far as to say they won’t even meet with Judge Garland. Senator Toomey is on record as saying the Senate should not consider any nominee for the Supreme Court vacancy. This highly qualified nominee deserves an up-or-down vote. 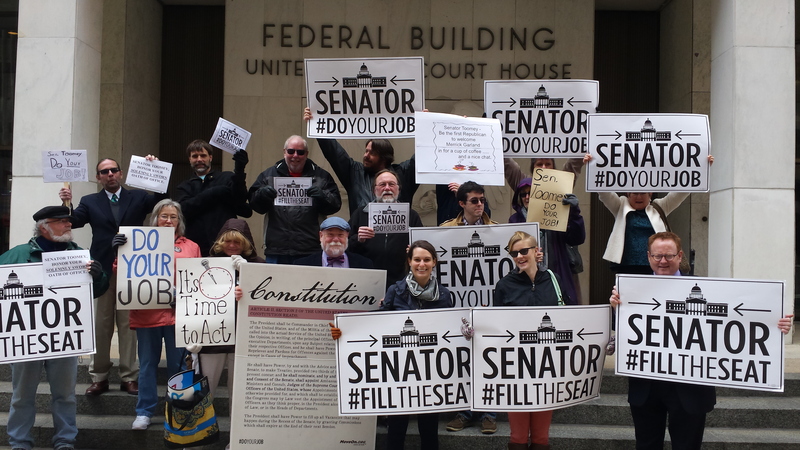 Sign here to tell Senator Toomey that Pennsylvanians expect Senator Toomey to take this process and this nominee seriously, and we look forward to the next steps in the confirmation process–­­ a fair hearing in the Judiciary Committee and full­ Senate vote for Judge Garland. The current president was elected by the people by a healthy margin and is not yet a lame duck. The so-called “Biden Rule” does not exist. It is nothing but a farce. Your Congress is the least productive in history because you refuse to work with President Obama on anything, which is why we are faced with the prospect of a President Trump. Trump! 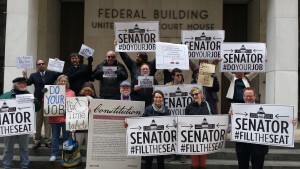 Do your job, Senator Toomey! Senator Toomey should represent his constituents and follow the constitution rather than representing only the Republican party. 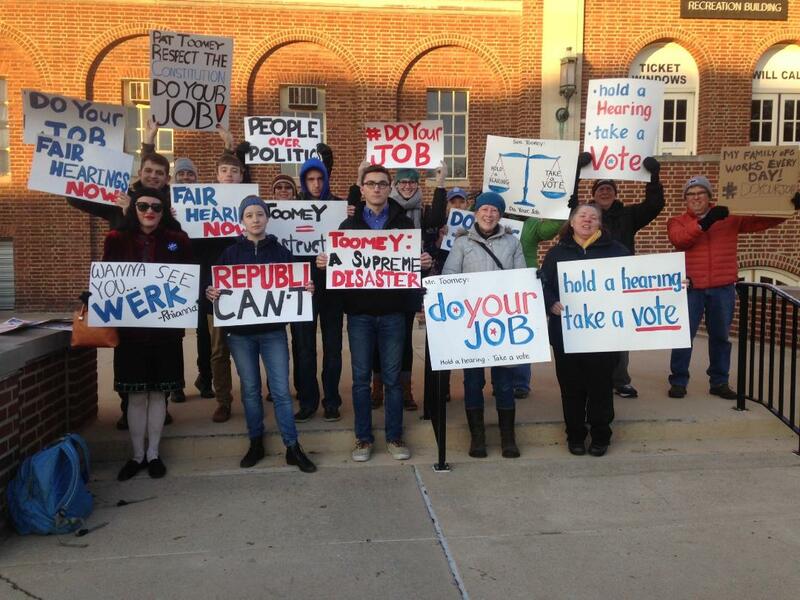 Toomey makes $174,000 per year, and does nothing except what the Republicans tell him to do: OBSTRUCT EVERYTHING. He is partly to blame for the rise of Trump.